In her two award-winning short documentaries Passing (1996) and Fuori/Outside (1997), New York-based filmmaker Kym Ragusa explores the limits of the documentary genre in order to portray the centrality of race and ethnicity in U.S. women’s experience. Employing the narrative techniques of storytelling and the imagery of personal memory, Ragusa’s films relate a past that is broadly historical, yet anchored in the intimate relationships between a granddaughter and her grandmothers. Each film emerges from Ragusa’s research into the life of one of her grandmothers and reveals the social pressures and prejudices the older woman confronted. As her grandmothers’ lives connect to the present through the filmmaker, their stories provide crucial insight into how race and ethnicity continue to shape identity both inside and outside the family. Passing records a story told to Ragusa by her African American grandmother about an incident that occurred in 1959 during a trip she took from New York City to Florida. Using still images, archival footage, and a soundtrack that mixes blues and gospel, Ragusa evokes the racial tensions of the time and creates a multilayered narrative around gender, class, and color. Traveling with an African American male friend (her then lover), the grandmother encounters the segregated and racially hostile South for the first time when her companion sends her into a diner in North Carolina to purchase food for a picnic. Inside, two white male customers repeatedly confront her with the question “What side of the tracks are you from?” When she realizes that they are asking her race, Ragusa’s light-skinned grandmother also realizes that her companion has presumed that she will be able to “pass.” Her courageous response to the people in the diner carries with it an aftermath of fear—will the two white men pursue them?—and unsettling questions about the supposed community among people categorized as racial outsiders by white social norms. I don’t know where I was conceived, but I was made in Harlem. Its topography is mapped on my body: the borderlines between neighborhoods marked by streets that were forbidden to cross, the borderlines enforced by fear and anger, and transgressed by desire. The streets crossing east to west, north to south, like the web of veins beneath my skin. In the prologue of her acclaimed memoir, The Skin Between Us, Kym Ragusa writes of a journey she took in 1999 to her paternal ancestors’ home of Messina, Italy. A year after the death of her two grandmothers—the central figures in her personal life, each representing her Italian and African-American heritage respectively—Ragusa embarks on a search for clues about her identity. This journey is symbolic of her artistic work as she is constantly involved in the formulation and explication of what it means to be multicultural. 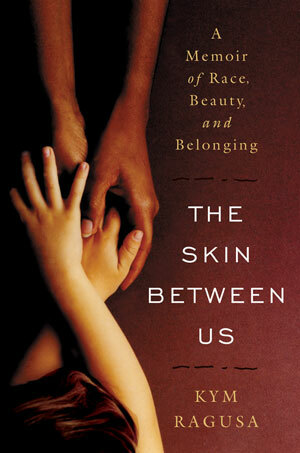 A memoir of astonishing delicacy and strength about race and physical beauty. Kym Ragusa’s stunningly beautiful, brilliant black mother constantly turned heads as she strolled the streets of West Harlem. Ragusa’s working-class white father, who grew up only a few streets (and an entire world) away in Italian East Harlem, had never seen anyone like her. At home their families despaired at the match, while in the streets the couple faced taunting threats from a city still racially divided—but they were mesmerized by the differences between them. From their volatile, short-lived pairing came a sensitive child with a filmmaker’s observant eye. Her two powerful grandmothers gave her the love and stability to grow into her own skin. Eventually, their shared care for their granddaughter forced them to overcome their prejudices. Rent parties and religious feste, baked yams and baked ziti—Ragusa’s sensuous memories are a reader’s delight, as they bring to life the joy, pain, and inexhaustible richness of a racially and culturally mixed heritage.